Here is a nice start to our New Year with Essential History Expeditions ! 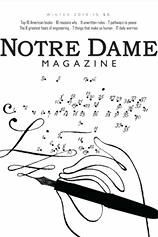 Notre Dame Magazine just published a short article on our company in today’s Winter issue. It is called “Adventures in History” and is in the “Short Stories” section on page 68. Forget taking it easy. When Brian DeToy ’85, a lieutenant colonel, retired in March of 2013 after 28 years of Army service, he and his wife, Sheryl, decided it was time to open a business. So the following year they led family members and college pals on an educational tour of Normandy on the 70th anniversary of D-Day. Essential History Expeditions was launched. DeToy conducted numerous tours of battlefields during his military career, which included 14 years teaching history and military science. When Brian went “kicking and screaming from the job” because of mandatory retirement, Essential History Expeditions (historyexp.com) offered him and Sheryl a way to combine his love of writing, teaching, history and travel with her desire to explore worldwide cultures. This year their company, billed as a way to “discover history,” is offering at least six tours. The expeditions include “Petersburg, Appomattox and the End of War,” “New Orleans: A Nation’s History in the Big Easy” and “Twilight of the Napoleonic Era: Waterloo at 200.” The trips, says Brian, “take advantage of things going on historically” and add the art, culture and heritage of the areas visited. So along with a visit to the 1815 battlefield at Chalmette, for instance, the New Orleans trip includes a sampling of the area’s signature music, food and architecture.